Sat, Apr 18th, 2015 Lynne & Rich met me at an art show in downtown Sarasota in 2014 and though they liked my work, they were not ready to talk about artwork for their new home. Sat, Feb 28th, 2015 I met Reiko & Phil in 2011 at an art show in Dunedin, FL. They loved my work, but their home was still being renovated. I saw them each year for a few years and then I received an email - we are renovating our bathroom and we want a piece from you! Thu, Feb 26th, 2015 I have known Susan and Al for quite a few years now. 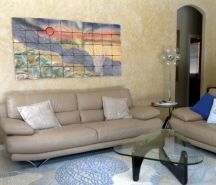 I'm happy to include them among my top collectors as they have purchased many wall murals from me over the years. Mon, Jan 12th, 2015 I met Jill & John in Denver, Colorado but they live in Texas. 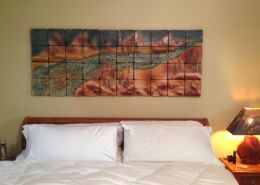 We began our discussion about creating custom tile wall art for their Guest Room in Colorado, but once they got home to Texas, the real details began. 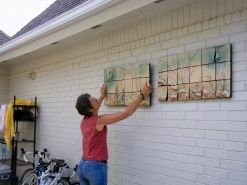 Thu, Oct 16th, 2014 I'm working long days in the studio creating a 30" x 72" custom tile wall art piece for Rob in Texas. 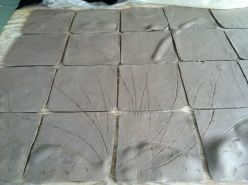 I began the first day laying out 40 clay tiles on my table and sketched out the image we agreed on. 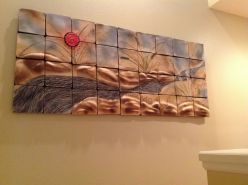 Sat, May 31st, 2014 Bill & Linda met me at the Winter Park Art Festival and now I'm creating a bamboo wall art piecel for their newly renovated master bathroom. 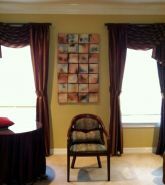 This location is perfect for a piece of undulating wall art. 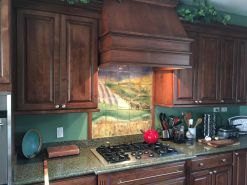 Sun, Mar 16th, 2014 My Sarasota client is renovating his kitchen and has hired me to create a custom kitchen backsplash behind his 6-burner viking stove. Thu, Jan 30th, 2014 It comes up often as I travel across the country. I meet people who love my wall murals... but they're just not sure. That makes sense to me. 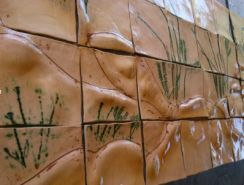 It's one thing to see these sculptural murals on a wall at an outdoor art show, but quite another to visualize it on your wall. Fri, Jan 3rd, 2014 I have been a yogi for over 12 years, and though I am familiar with the Om, I never knew about the Tibetan Prayer Wheel. Wed, May 29th, 2013 Jim & Sheryll just built a beautiful home in rural Ohio. This dream house is set back in the woods, overlooking a grove of trees, beyond which is a river. Tue, May 21st, 2013 I'm gearing up for a long trip out west - from Iowa to Denver to Park City Utah! So I've been in a throwing frenzy. Tue, May 7th, 2013 I met Mike and Marilyn in Melbourne Florida at the Melbourne Art show. 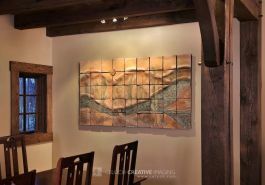 They loved my sculptural wall murals, but didn't see a piece that would work for them. We had a short conversation about a potential commission and later that day they invited me over to their home to see what they were thinking. Thu, Feb 28th, 2013 Discussions with Mr. H began about 3 years ago; drawings and a commitment were set up in the spring of 2012 and now, after a few delays on both my side & my client's side, the mural is underway. Sun, Sep 23rd, 2012 I'm excited about this next commission. 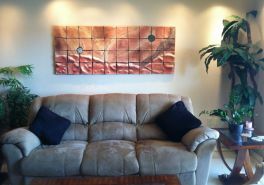 Judy & Jim, in Houston, TX asked me to make a wall mural for their bedroom in my traditional Saggar Firing technique. I haven't done one of these in a while, so it's been really exciting to do it. All I needed was a request! 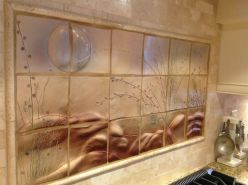 Sat, Sep 22nd, 2012 The final decision was made for the wall mural to go above the vanity in this Texas bathroom. 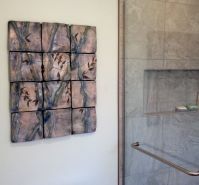 Fri, Sep 14th, 2012 It's been a busy summer between commissions, art fairs and private home showings. But I'm back in the studio finishing up 2 commissions for my Texas Private Home Showing this October. 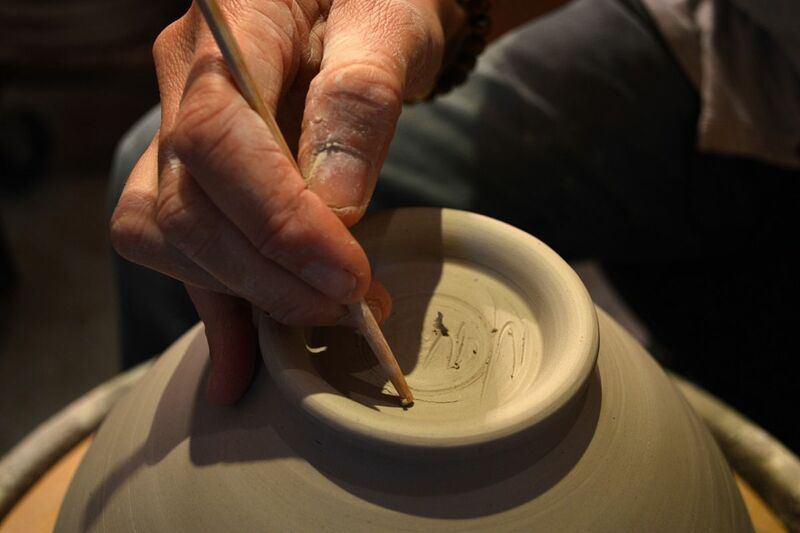 Russell & Christine got a peek at their first commission firing last month. Today I fired the second one and have the results.